Being an environmentalist means never having to say you are sorry. You can get it wrong again and again and the media will fall for your next scare with zero skepticism. I'm in Los Angeles. Up and down the coast the air is thick with smoke from record wildfires. It’s the current crisis and of course we are told that excess heat from manmade climate change is to blame and we need to Make America Poor Again in order to solve the “crisis.” President Trump has pointed out that environmental opposition to forestry has created record conditions for record combustion but the “experts” and the media have dismissed his claims. How quickly Californians and the media forget. Less than 18 months ago over 200,000 Californians faced the possibility of losing everything--their homes, their belongings, their livelihoods, even the towns they live in – not because of drought but because of rain as the nearby Oroville Dam threatened to collapse. The dam in Northern California is the highest in the United States. It was struggling to cope with the amount of rain and melted snow pouring into the reservoir. A failure would have seen multiple towns wiped off the map. It was almost one of the worst catastrophes in American history. At the time California embarked on a desperate attempt to divert water and repair the dam. And of course there were equally desperate attempts to divert attention from those responsible for allowing it to happen. For this was no “natural disaster." It was the result of a wet winter meeting decades of infrastructural neglect, but more importantly, it is the result of California’s liberal establishment corrupting science and working with partisan scientists to push a political ideology. 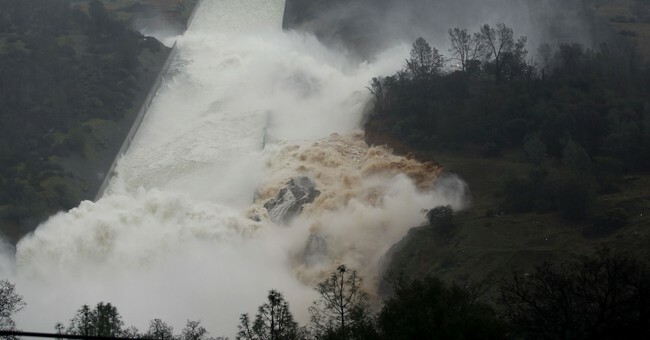 As California’s dams crumbled, we were told clearly and emphatically by experts, scientists, and politicians (the same ones attacking President Trump), that it didn’t matter. None of them advocated for or took serious steps to rebuild the infrastructure. Why? Well because this type of crisis would never happen--could never happen – because there would never be significant rainfall in California again. And obviously with climate change so certain and the drought so permanent, there was no need to spend money securing dams. What would be the point? Even if it rained, a wet year “may end the ‘precipitation drought,’” but “higher and higher temperatures and a persistent ‘snow drought’ are here to stay,” warned Dr. Peter Gleick, Chief Scientist of the Pacific Institute, just last year. Then the rain came. At the time of the Oroville crisis California’s snowpack was at 184% of average and 200,000 people and their communities almost paid the price for this delusion. The scientific and political consensus made it not only OK to ignore deteriorating dams, but also encouraged spending large amounts of time and money on various schemes to combat manmade climate change. Scientists demanded and politicians legislated. No joke - California politicians thought it was more important to push through regulations to limit cow flatulence than to address infrastructure projects. More seriously, these same politicians have allocated an incredible amount of money to get people out their CO2-producing cars. Governor Brown decided the state needed to spend $40 billion on a “bullet train” from Los Angeles to San Francisco. The only thing fast about this train is how quickly the costs are going up. It is now projected to cost $64 billion and has been delayed for years. Of course, a fraction of that cost could have secured the Oroville Dam and probably every other dam in California. But that never crossed the minds of California’s liberal politicians who believed they were entering a new water-scarce world. When Professor Mann talked about a water crisis, he was, of course, referring to the state’s mythical “unending” drought. Well, lots of Californians and their communities did face a horrendous manmade water crisis. They faced the prospect of 100,000 cubic feet of water per second cascading through their towns, farms, and homes. Luckily that crisis was averted. But there was no apology from the scientific and political ideologues who made these communities vulnerable in order to push their agendas. And now we have another crisis as we face record forest fires. Again of course the experts claim it is climate change and nothing to do with environmental opposition to forestry which would thin out forests and make them less vulnerable to fire and the spread of fire. They will never admit they are wrong and they will never admit they are at fault – instead they create fake droughts and try to blame us. Then when a real crisis comes along whether it is flood or fire they don't admit they are wrong. Instead the rest of us are to blame and political control and impoverishment is the only solution.